For Joe Burns, driving and owning an MX-5 Miata has become a family affair. Twenty-five years ago, Burns purchased his first MX-5. It was a red 1991, which he taught his wife how to drive when they were first dating. “I just absolutely fell in love with it,” Burns said. “It was probably one of the best decisions I ever made.” The couple decided to sell the car just weeks before the birth of their daughter, but that was not the end of their MX-5 story. Flash forward 17 years, with their children old enough to drive their own cars, Burns’ wife suggested that it might be time to buy another MX-5. They bought a blue 2004 MX-5, which he jokes was “hijacked” by their daughter. 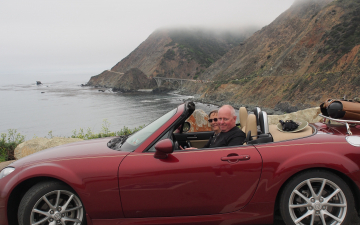 Burns’s daughter would go on to drive her own 2009 MX-5, which she entrusted to Joe and his wife for safekeeping before she went off to college. “She gave me the key back and said, ‘Please keep this, because we'll be driving this in the future.’ So, that's how we kind of ended up where we are today,” Burns said. The car “built for two,” as Burns describes, has such a special place in this family, that he even created a poem book for his wife as a Christmas gift, detailing the adventures and joy this car has brought them over the years.